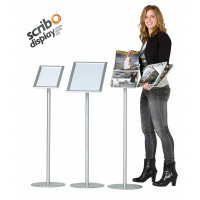 The range of trade show displays offered by Scribo Displays includes portable posterstands that come in small multifunctional packages and can be assembled and dismantled easily in a short time. These posterstands come with bases that have rubber protection, too. The kit also includes a padded transport bag that contains accessories like aluminum snapframes. These poster stands are available in different sizes and the orientation of the posters can be switched easily form landscape to portrait and vice versa. So, come and sift through our collection of posterstands that can play a major role helping you to attract customers.